The Rosa Grand hotel captures all the elegance and refined allure of Milan, offering its guests a level of style and sophistication that truly reflects the Italian capital of fashion.Set in the heart of Milan, the Rosa Grand overlooks the historic Piazza Fontana, behind the city’s imposing Duomo cathedral. Enviably located, the exclusive fashion district and the art collections of the Palazzo Reale and the Museo del Novecento are all within strolling distance. Nearby stands the world-famous La Scala opera house and the famous Galleria, home to chic boutiques of prestigious brands and historic cafés. The tastefully designed interiors of the Rosa Grand create a warm, inviting atmosphere in an intimate and private setting. Elegant decor, accented in gold and pink, reflects quintessential Italian craftsmanship. Particular attention has been given to the lighting design, a decorative element as important as the many artworks, vases of fresh flowers and stylish armchairs. 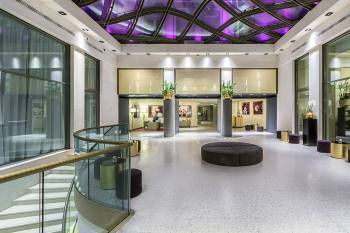 With its central location in the heart of Milan, the Rosa Grand hotel also offers the perfect ambiance for business meetings and private events.The hotel offers a multifunctional conference centre with eight meeting rooms that can accommodate up to 300 people. The eight spacious rooms, with dimensions ranging from 46 square metres to over 250 square metres, provide the perfect setting for every event. Some rooms are adjacent and can be joined, depending on clients’ needs and the number of guests.For spectacular events, the perfect setting is the prestigious 210-square-metre Fontana Hall, with its large windows overlooking Piazza Fontana. It’s one of the most sought-after locations in Milan for fashion shows, product presentations and automobile displays, as well as for ceremonies and formal receptions.